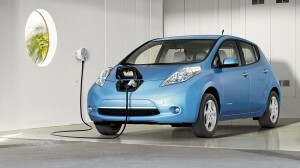 Through Globalization, and American Workers, the 2013 Nissan Leaf is now lower priced that the CODA. This leads to two questions, are Leaf sales pickup up and can CODA keep up? We drove both of the cars at the Southern California Electric Car Expo, and the Nissan Leaf was clearly the better car. Even though the Coda looked like an older body Nissan Sentra, given how much less it cost than the Leaf, it was a contender. Now that the Nissan Leaf can be made less expensively in the U.S. than in Japan, Nissan has reduced the price of the U.S. made Nissan Leaf by $6,400. The new base price is $28,800 before the $7,500 federal tax credit and the $2,500 California tax credit. Check the EV tax credit in your state if you do not live in California. New for the 2013 model is an optional 6.6-kWh charger that reduces the charging times, allowing quick top offs at charging stations for those who have longer commutes. So the question is, are you ready for an electric car? At the new lower price, Nissan is advertising a lease on the S model, the most basic leaf for just $199 per month. That is less than many people in LA spend each month on gas. Even as a second car for commuting, the Leaf is really starting to make financial sense. With a range of up to 75 miles, that covers a lot of round trip commutes. Have a charger at work? You can do up to 75 miles each way. Remember, stop and go traffic doesn’t effect the range of an electric nearly as bad as a gasoline powered car. Let us know what you think about the Leaf at it’s lower price.